Florence Wilson was born in Vancouver on June 18, 1901. While she had always wanted to be a nurse, she received little support from home, so began working at the family farm in Port Coquitlam. She married and had five children, but was widowed at the age of thirty-six. Realizing she wanted more in her life and for her children, she started her journey to become a nurse by attending night school. She graduated from the Practical Nurse program on March 23, 1952 at the age of fifty-one. Her family, including her first grandchild, attended her graduation. Florence proudly wore her cap with the traditional green cross indicative of practical nursing. Florence started her nursing career at the Canadian Cancer Institute on Heather Avenue in Vancouver. She joined the Practical Nurses Association of BC, and with Kaye Gilchrist and Florence Deschner worked tirelessly to lobby the government to proclaim the Practical Nurses Act, which finally happened in December 1965. The three became the first three practical nurses of the BC Council of Practical Nurses, with Florence awarded License No. 1 for her leadership and hard work. In July 1974, on her retirement from her position as a member of the LPNABC, the Vancouver chapter of LPNABC honoured Florence Wilson with a brooch and silver plate to commemorate her legacy within the association. Florence later became a private nurse for clients in their homes. She worked as an LPN until she was eighty-three, and even after that remained busy. She drove her car until she was ninety-one, and lived in her own home until she passed away on May 27, 1991, just before her 92nd birthday. 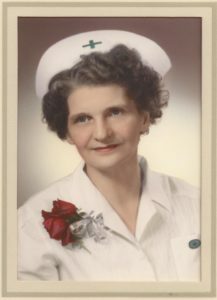 The records include a transcript and diplomas of Florence Wilson’s education and other documents as the first LPN in BC. It includes three photographs of Florence Wilson and her 1952 graduating class, and a silver tray and brooch awarded to her in 1974 in recognition of her dedicated work to bring greater recognition to Licensed Practical Nurses. Accession Note: The records were donated by the Wilson family through Anita Dickson, LPN, in April 2012.